Today’s Topic: If you have been blogging for a while, what is your favorite sentence or blogpost that you have ever written? Is it diabetes related or just life related? If you are a new blogger and don’t have a favorite yet, tell us what motivated you to start sharing your story by writing a blog? (Thank you Laddie of Test Guess and Go for suggesting this topic.) To read other posts on this topic, click here. You probably noticed above that today’s topic was my!!! idea in response to Karen Graffeo’s request for help. I selfishly suggested this topic because I have a favorite sentence that I always read with astonishment that I wrote such a beautiful thought. 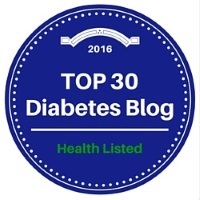 The sentence has nothing to do with diabetes but it is part of a blogpost that celebrates all types of diabetes, dogs, cats, and DOC friends. 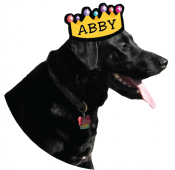 I’m Abby the Black Lab and it has been a while since I have written a blog post. Lately I have been utterly distressed by a great divide that I see in the DOC (Diabetes Online Community) and I think it is time to bring this to the attention of my readers. You probably think I’m going to start talking about the Type 1 versus Type 2 wars that periodically surface on the Internet. Are you kidding? My subject is not nearly as trite as that. No, it’s the dog people versus the cat people. The canines versus the felines. The lovable, loyal, goofy, tail-wagging dogs versus the slinky, aloof, meowing and menacing kitty cats. The cat aficionados have long been led by Kerri from Six Until Me whose cat Siah is a media star who poses in laundry baskets and attempts to dominate the DOC as an “internet celeb-kitty.” The dog people are more decentralized in their leadership. Canines have conceded Twitter to the cats, but think that we rule Facebook. The blogosphere is probably a toss-up, but my opinion is that dogs are truly superior in their contribution to their PWDs (people with diabetes). Duchess is a diabetes service dog who daily keeps her owner Tarra safe. Meri’s boys are protected from the abyss of low blood sugars by Lawton the Yellow Lab. All human hearts have melted seeing photos of Kim’s corgi watching over the new baby “Rabbit.” Black labs like Riley owned by Mike Hoskins insist that their owners exercise by taking them for daily walks. Cats meanwhile are tiptoeing across keyboards and writing meaningless blog posts with the tag line “zxzxzxdjjj.” Pissed-off and non-sleeping kitties are considered newsworthy. Oh yeah, Chris of @iam_spartacus fame has some feisty looking cats and @KarenBittrSweet claims to have the world’s cutest cat. Videos of Grumpy Cat are ubiquitous, but if I want to see grumpy, I can look at my owner Laddie when her meter says 286. Fortunately the DOC universe of cats and dogs has recently been in a state of equilibrium with only a few ripples of discord. The dog people tried to sneak one under the rug in Twitter and Facebook with the purchase of a Scottish Terrier named Bella by Cherise. Someone needs to tell Bella that if she wants to become an icon in the DOC Canine Hall of Fame, she should learn to walk on a leash. Also tell her that if she’s going to be a supporter of people with diabetes, lancet devices should not be on the menu. The cat people have lost some heroes as Kerri and Pancreassasin mourn their beloved friends who have gone to the scratching post in the sky. (RIP Prussia July/2013 and Pancreassasin 2week kitty August/2013). But the calm has been shattered! Earlier this month the cat people added a new superhero to their roster in the guise of a young child named Birdie. Smiles and cute Batman Princess costumes are not adequate to camouflage the chaotic schemes of this young and seemingly innocent feline-loving child. With no attempts to disguise her evil intent, this child suggested that the family cat Siah was lonely and needed a friend called…. 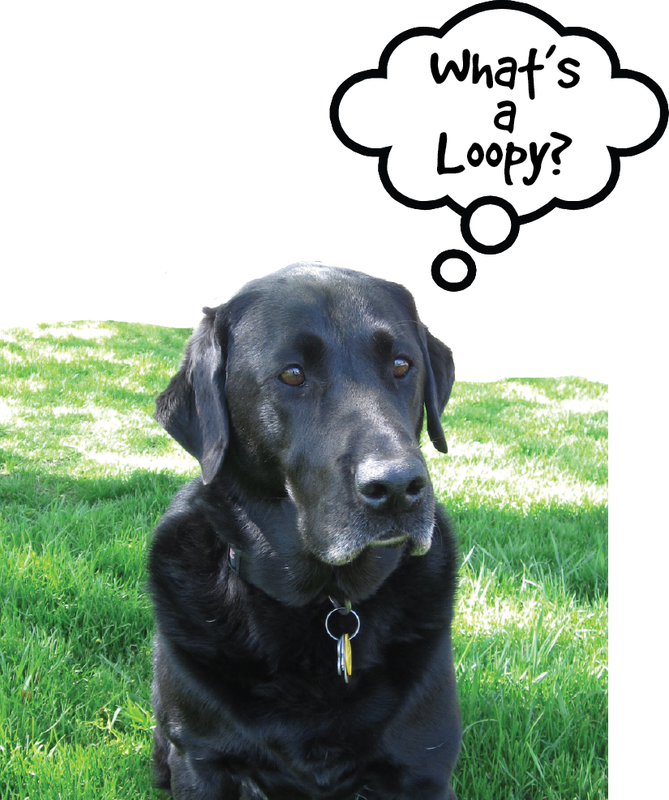 Loopy. The Loopy hullabaloo has not been all. Another scandal has been exposed in the DOC and I, Abby, a supporter of all people with diabetes, have been accused of consorting with the enemy. 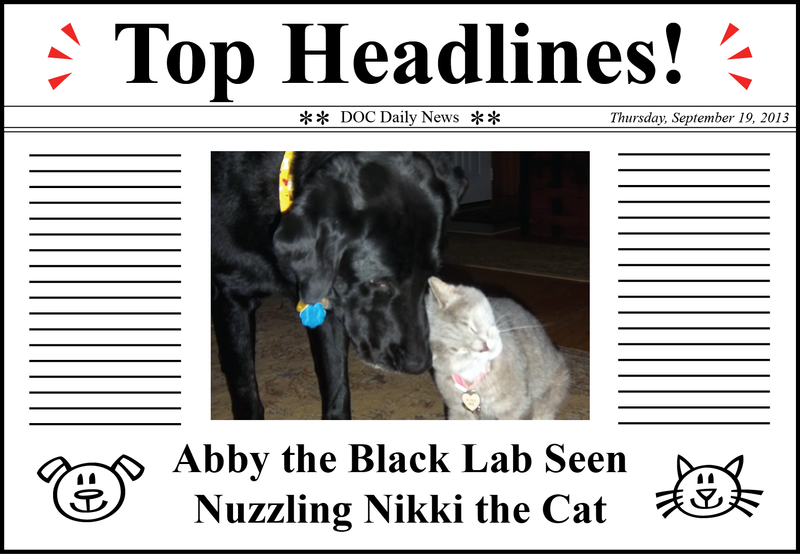 A photo of a certain black lab being nuzzled by a gray feline has been splashed across the headlines. I confess. I am guilty. I like cats and cats like me. Every year I put “Kitten” at the top of my Christmas list. Unfortunately my owner Laddie is allergic to cats, so no personal kitty is in my future. I am extremely fortunate that when Laddie travels, I get to go to Linda’s house and visit my friend Nikki. Nikki is a shy cat, but I have learned to approach her slowly and lay my head down acknowledging that cats are supreme. She rewards me with purrs and caresses of her head against mine. It is a magical glimpse of heaven for a lucky black dog who is showered with love by a beautiful princess gray cat. My romance with Nikki has some important lessons for everyone. Although you seemingly-civilized people with Type 1 diabetes sometimes argue with those who have Type 2 diabetes, you pancreatically-challenged doofuses should remember that you are stronger together than apart. Diabetes in all of its evil forms is the enemy and you should join hands and conquer it together. More importantly, we dogs and cats should toss aside our petty differences and stop the harassing hisses and barks. With a united army of canines and felines, we can fight a cosmic battle against our common enemy. A enemy who taunts and teases us in our own yards and through our own windows. An adversary who seems to think that dominance is achieved through water-skiing videos. 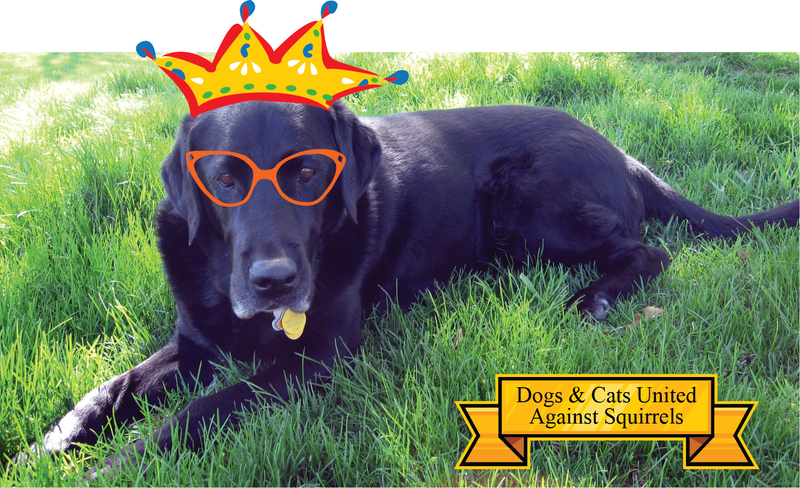 We have seen the enemy and the enemy is……..SQUIRRELS!